Exercise is healthy for body and mind. Our fitness center is ideal for everyone, whether you are normally practicing or just want to get started. 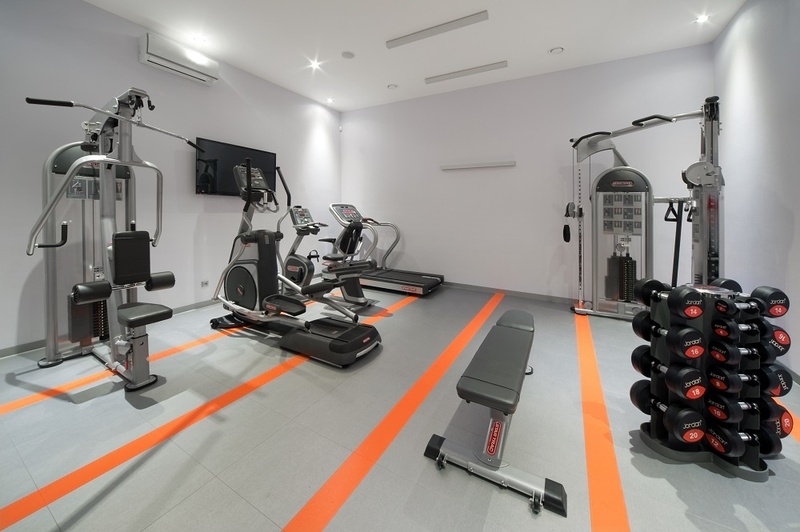 If you want to do something for your health, do not be afraid to visit our fitness center. Get rid of excess kilos, improve your mood, fitness and ability to cope with everyday stress. The cardio zone will satisfy even the most demanding clients. You will find here modern STAR TRACK machines. Treadmill - The treadmill is suitable for professional athletes, elders and moms who want to shed extra pounds and engrave their character. The treadmill helps shape the lower body. Running on the trainer has a number of positive effects on the whole body. Bicycle with backrest - The bike is appreciated by its easy and comfortable operation, deep onset and comfortable saddle with backrest for both elderly people who want to keep fit and people with reduced mobility who need to rehabilitate for example after an accident. Universal booster machine - counterclockwise pulleys with height-adjustable pulley position and barrier to complex upper body exercises. Stretch Adjustable Bench - Bench offers the stability that is required in professional toy training. Dildren training is and remains the most varied individual training. Bench is the foundation for intensive strength training in a professional style. The set of rubberized dumbbells - 2 to 20 pounds, with which you suffer not only the muscles of your hands.